Gonzaga is once again the No. 1 team in America in the updated USA Today Coaches Poll Top 25, which was released on Monday. The Zags held their spot for a third consecutive week. Trailing at Nos. 2 and 3 this week are Virginia and North Carolina, which held steady from a week ago. Rounding out the top five is Kentucky, which moved up two spots to No. 4 with wins over Ole Miss and Florida, and Duke, which dropped one spot to No. 5 after going 1-1 with a loss to UNC this past week. 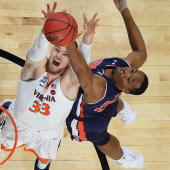 Gonzaga received 28 of a possible 32 first-place votes, while Virginia received the remaining four. Others receiving votes: Central Florida 27; Mississippi State 26; VCU 21; Utah State 19; Hofstra 13; Washington 11; Arizona State 11; Murray State 10; Iowa State 8; Louisville 3; Seton Hall 3; Liberty 2; Baylor 1; UC Irvine 1.